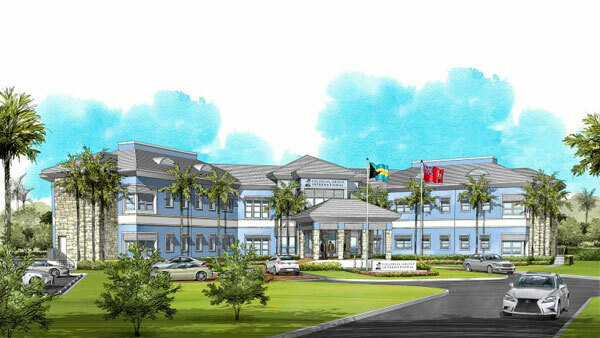 Colonial Group International (CGI) – the parent company of Atlantic Medical Insurance Co Limited, Security & General Insurance, Colonial Pensions Services (Bahamas) and the Nassau Insurance Brokers & Agency Limited – will invest $4 Million in Grand Bahama through the construction of a state-of-the-art building to become its northern hub of operations. CGI showcased this architectural rendering of the proposed facility at a recent groundbreaking ceremony. FREEPORT, GRAND BAHAMA – Colonial Group International (CGI) – the parent company of Atlantic Medical Insurance Co Limited, Security & General Insurance, Colonial Pensions Services (Bahamas) and the Nassau Insurance Brokers & Agency Limited – will invest $4 million in Grand Bahama through the construction of a state-of-the-art building to become its northern hub of operations. Situated on 1.5 acres of prime Freeport real estate on The Mall, the 12,000-square foot building will be a fully integrated business campus.